i-MBA > 14th i-MBA Career Fair was concluded with great success! 14th i-MBA Career Fair was concluded with great success! 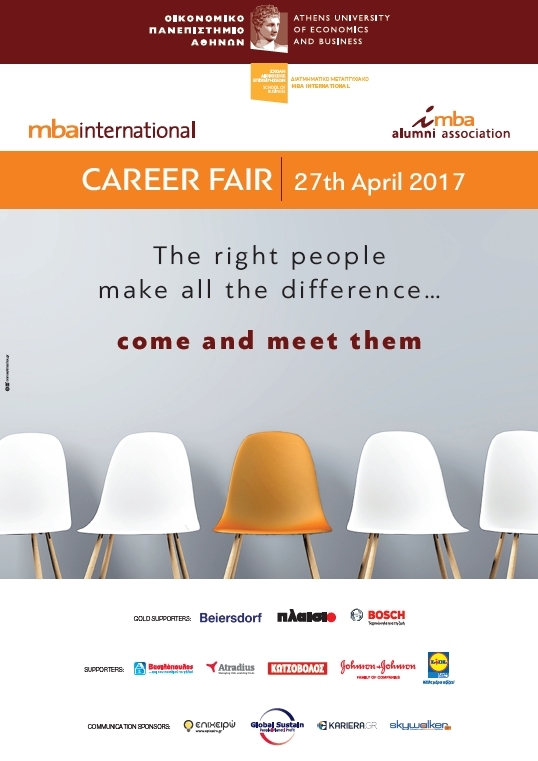 The 14th annual i-MBA Career Fair was successfully concluded on Thursday, 27th April 2017. 41 companies, representing more than 12 industry sectors, including Financial Services / Banking, Consulting, Energy, Food & Beverage, Fast Moving Consumer Goods, Professional staffing and HR services, Retail, Industrials, IT, Telecommunications, Health, Pharmaceuticals, etc., were there to meet and interview approximately 100 students and alumni of the program who participated in the event. It’s worth noting that 10% of the companies hired directly from the career fair and 49% of the companies have already proceeded to a second round of interviews with the program’s students and alumni. The event brings together experienced professionals and entry level talented individuals with some of the biggest multinational and Greek companies. With strong and diverse academic and professional background and skills that are instilled at the program’s curriculum (leadership skills, strategic thinking, international exposure, ability to leverage technology and achieve high level results, etc), our students and alumni fulfill the diverse needs of companies of all sectors, and have proven to be a strong asset for them. The Career Fair is one of the services offered by the Career Office of the program, aiming at students’ career development and advancement. It’s worth noting that 92% of the students have jobs within 6 months of graduation (Career statistics 2016). The following companies were the Gold Supporters of the event: Beiersdorf Hellas S.A., Plaisio Computers S.A., Robert Bosch S.A. The event was also supported by AB Vassilopoulos S.A., Atradius Crédito y Caución S.A. de Seguros y Reaseguros-Hellenic branch, Dixons South-East Europe AEVE, Johnson & Johnson Hellas Consumer S.A., Lidl Hellas & SIA Ο.Ε., and was kindly communicated by epixeiro.gr, Global Sustain, kariera.gr and skywalker.gr.